Chicago, IL. Publisher: Hermetic Publishing Company. Editor: W.P. Phelon, M.D., and Mrs. Mira M. Phelon, C.S.B. ; Nancy M. Gordon. 1/1, October 1887-7/5, November 1899. $1.00 a year. Still being noted in the Metaphysical Magazine, July 1901, so the journal may have continued after 1899, 4-16 pp. (varies), 6 1/2 x 8 1/2. This was one of the organs of the Temple of Isis of the Hermetic Brotherhood. The editors, first in Chicago and later in San Francisco, were W.P. Phelon (1834-1904) and his wife, Mira Morse. Phelon was an early convert to Christian Science and was a founder of one of the Chicago branches of the Theosophical Society (into which he inducted L. Frank Baum, the author of the Wizard of Oz), but early on he began teaching his own brand of wisdom (derived from the lost civilization of Atlantis) under the name of the Hermetic Brotherhood of Atlantis, Luxor and Elephanta. The relationship of this to the H.B. of L., of which Phelon and his wife became members in 1887, is unknown. R.S. Clymer, who joined the H.B. of A.L. and E. and for a time carried its pronouncements in his Initiates, incorporated Phelon and his work willy nilly into the chain of initiatory transmission from P.B. Randolph, but there is no evidence the two ever met and Phelon never mentions Randolph. By the time Phelon died in San Francisco in 1904, his movement was claiming direct control by the brothers in the hidden “Mountain City” in Mexico, inaccessible physically but able to be visited astrally. 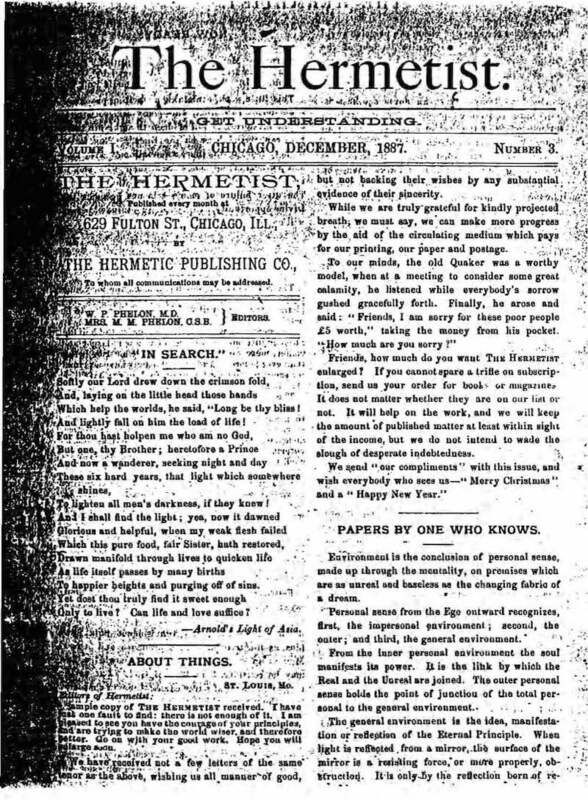 The journal prominently featured advertisements for the works of Phelon and his wife, Mira, and for content it copied from Arnold’s Light of Asia and Madame Guion. It published articles by “Philangi Dess,” whose The Buddhist Ray seems to have been closely connected with The Hermetist, and also pieces by Ursula Newell Gestefeld (who was one of the principals in the publisher, the Hermetic Publishing Company). From 1894 until at least 1904, the society also published separate annual proceedings of its convocations, and from 1901 published irregularly its Temple Talks, both of which had, earlier, appeared in The Hermetist. Rowell’s American Newspaper Directory for 1900 says the journal had a circulation of less than 1,000. LOC; Yale University.